A local alternative high school, engineer, Dave Strenski and I (along with another part-time librarian) met with the teens from the TSC for a meet and greet. 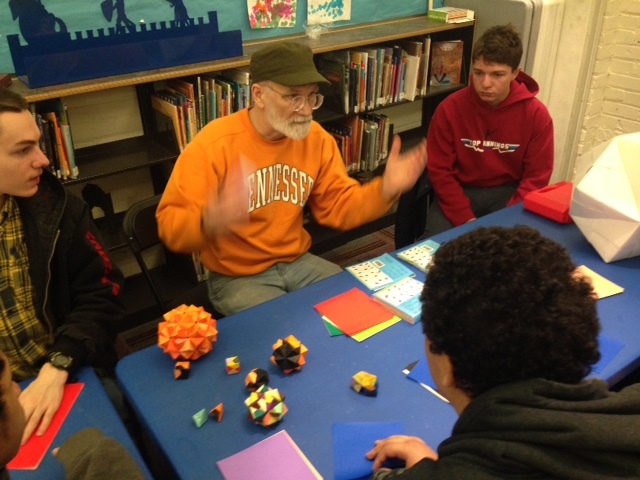 Dave taught us about structure and dimensions of different polyhedron units and showed examples of them through his origami models. Café attendee Nathan putting the test structure design together. We all agreed that we would commit to weekly workshops to practice, build and troubleshoot how to create a large paper construction. To achieve the world record, the final sonobe ball is to be 8 ft tall and 100 lbs. This in itself creates some logistical problems, including where to find paper that large ( we need 4ft x 4ft sheets) that is thick , sturdy, and durable enough to support itself. The last challenge we faced was how to pay for the paper! 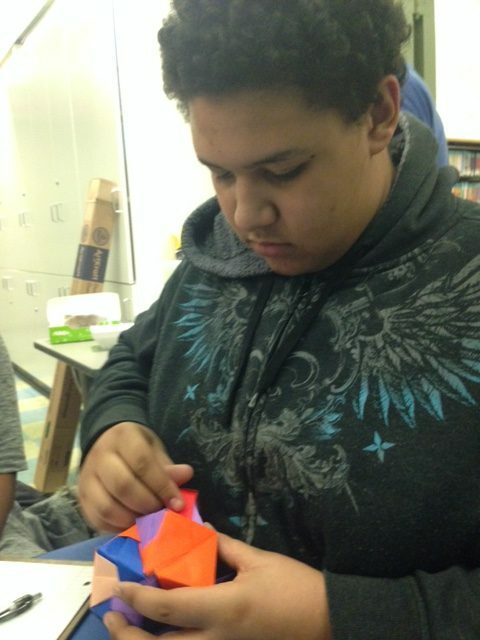 The first hands-on session was to learn how to fold the units and assemble them into polyhedrons. 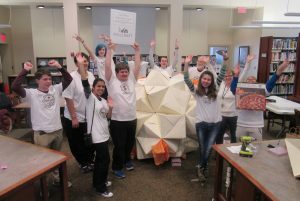 We used 6″ and 12″ paper to build a stellated truncated icosahedron using both sizes of paper. We’ve enlisted a local paper supply company, Millcraft Paper, as a sponsor for our world record attempt. For full disclosure, the Guinness application is still in process and has not yet been made official; we will be calling our event a “world record attempt” if the Guinness application is not approved in time. We cut 2′ pieces from that 4′ wide roll and folded them in half making 2′ x 2′ squares. Then folded those into Sonobe Units. The paper should make a ball about 4′ tall. We would need 90 2′ pieces, or 180′ of paper to create the ball. We had a fun time with the teens building the “test” ball. I’m so glad we did a test ball because we learned a lot! First it took longer to assemble than we thought. We started with a dozen kids, but most had to leave at 5:30, but three stuck with it and we got the test ball assembled by 6:00pm. See photo. The Sonobe Ball going 3-D. The paper is slippery, so when we tucked the flaps into the pockets they would slip back out as the ball got bigger. We modified the sonobe unit design to make a larger pocket, but still had troubles, so we had to resort to using tape. Not a big deal, the goal is to make a ball, so we can change the rules. :) We have 14″ by 26″ cutoffs, so Dave made another test ball experimenting with a better way to keep the flaps in the pockets. 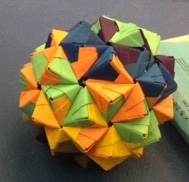 We used the cut off from last Thursday and made a new ball with 14″ paper. I used pop rivets to hold the flaps in the pockets and the ball is very solid and stable. See attached. I put tissue paper in all the pentagon holes to help me orient the ball during assembly. Dave had the brilliant idea that we needed to use rivets for the project. He talked to Mike, one of the teens, and Mike agreed that it would be good to reassemble the current ball using rivets. This Thursday the students’ plan is to take the current ball apart, replace some of the worst Sonobe Units, and reassemble it with rivets. An additional workshop will be on the following Thursday before the main event to pre-fold a few of the 40″ squares and make a cube or something simple (without rivets), to get a better feel how the larger paper works.